Today Im wearing one of the jumpers I featured in yesterdays haul video. I really love it actually. It's the perfect mix of casual and dressy that I can take a look from day tonight. I've been at my laptop working all day on a social project proposal for a brand so when I got dressed I wanted something easy and effortless that I can also wear to events. 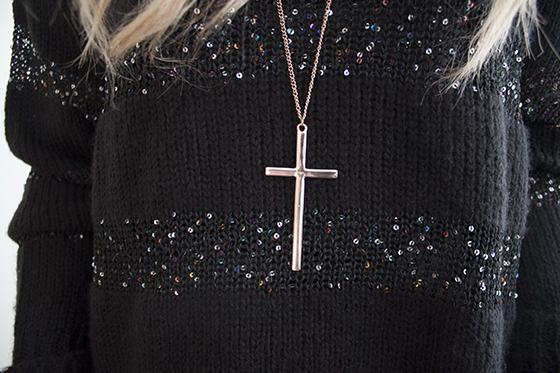 I forgot I bought this Topshop Rose Gold Cross necklace, I've gone off long necklaces in recent months and when I was sorting out my jewellery after I moved into my new house! A happy surprise though as it looks lovely and I cant wait to wear it more. I've worked out my nail polish is either Essie Sand Tropez or Chinchilly! I cant work out which and I really should have looked when I was in the salon as I really love it. Over the top of it I layered over my new glitter polish- Topshop Panther. It's a clear polish with matte black and holographic silver particles in which is a fairly unique polish to my collection. It gives a really fun "salt and pepper" feel to the nails which I like. that jumper is so nice! This jumper is really nice :) Will definitely have to take a trip to Primark! 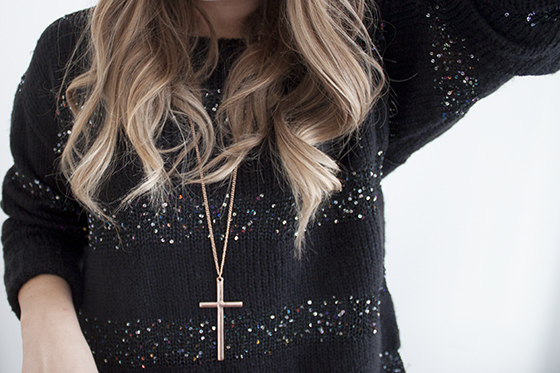 loving that jumper && the cross necklace, they look great together also! Love the jumper, had my eye on it myself! pretty jumper! the nails look like sand tropez to me, love them with the topcoat! That outfit would be perfect for NYE! I'm gearing up for Thanksgiving over here at the moment. Stop by my blog if you have the chance, currently featuring a DIY pink glittery pumpkin, my floral crown, a cat print dress, and a give-away! I love this, it's perfectly wintery without looking frumpy and boring. I don't know how you do it so well! Love the pleated skirt and jumper, such good bargains from primark! I love the jumper with the pleated skirt underneath! Love this skirt, wish they'd brought it back this season! Great look I love your jumper ! Love the look! Just in case you haven't seen it, I think something has gone wrong in your html! Your main content is now left aligned rather than centered on the page while the header is still centered. I'm using Firefox so could just be my browser/settings. Ohh loveee this jumper! Saw it in your haul but love it even more up-close, will definitely keep an eye open for this when shopping next!! Love this outfit and especially your hair! Looks beautiful curled. You look so pretty! Do you always go to a salon to get your nails done or do you do them yourself cause they ALWAYS look amazing? I really enjoyed your haul video yesterday and it's really cool to see how you've styled the jumper! The outfit looks gorgeous I love it :) It sounds silly but I'd never have thought to get jumpers in a bigger size to make them comfier, I will deffo be doing that from now on!! I want the whole Topshop nails collection but they don't ship nailpolish to Australia - it's so frustrating! Love the outfit too. Your hair is absolutely gorgeous! That jumper is super lovely as well! Love anything sparkly especially this jumper! I love the jumper!! How I wish I still lived in the UK! Primark rocks.. The jumper is so perfect! 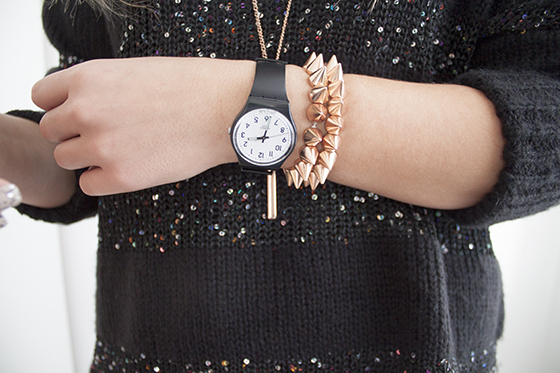 I love black with the colorful sparkles! Great jumper - and I love those salt n pepper effect nails - very nice!